Gunnar Örn Petersen was born and raised in Reykjavík, Iceland. His first childhood memories are from Lake Thingvallavatn, where his parents had to drag him to bed at midnight as he wouldn’t stop fishing. Since then, fishing, and later fly fishing, has been his passion. His guiding career started shortly after he received his driver’s license and for the first decade of the 21st century, he spent the summers guiding for Atlantic salmon in the renown Laxa in Leirarsveit. Gunnar Petersen's company has over thirty years of experience hosting and guiding fly fishers in Iceland. Trout, Salmon and Arctic Char can be caught there in some of the most scenic places in the world. Fly fishing in Iceland is different than most countries so listen in and find out all you need to know about fishing this unique fishery. There Gunnar learned the trade of guiding and instructing beginners as well as experienced fishermen. Gunnar is also a lawyer and practiced law for some years after graduation. However, his passion for fly fishing led him back to the river as he became a partner in Iceland’s leading trout fishing outfitter, Fish Partner. For the past few years, Gunnar has been guiding again and bringing fishermen to some of the finest salmon and trout fishing waters of Iceland. He is also the editor of the Fish Partner News, a monthly newsletter about fly fishing in Iceland. 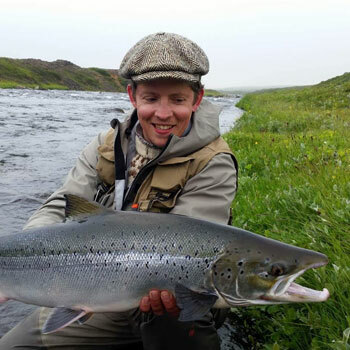 Recently, Gunnar has shared other Icelandic anglers growing concerns about the dangers the Atlantic salmon in Iceland is facing due to a rapidly growing farm fishing industry. As a conservationist, Gunnar became a founding member of The Icelandic Fly Fishing Show, a non-profit organization which has the objective of protecting Icelandic freshwater species, mainly Atlantic salmon, brown trout and Arctic char.